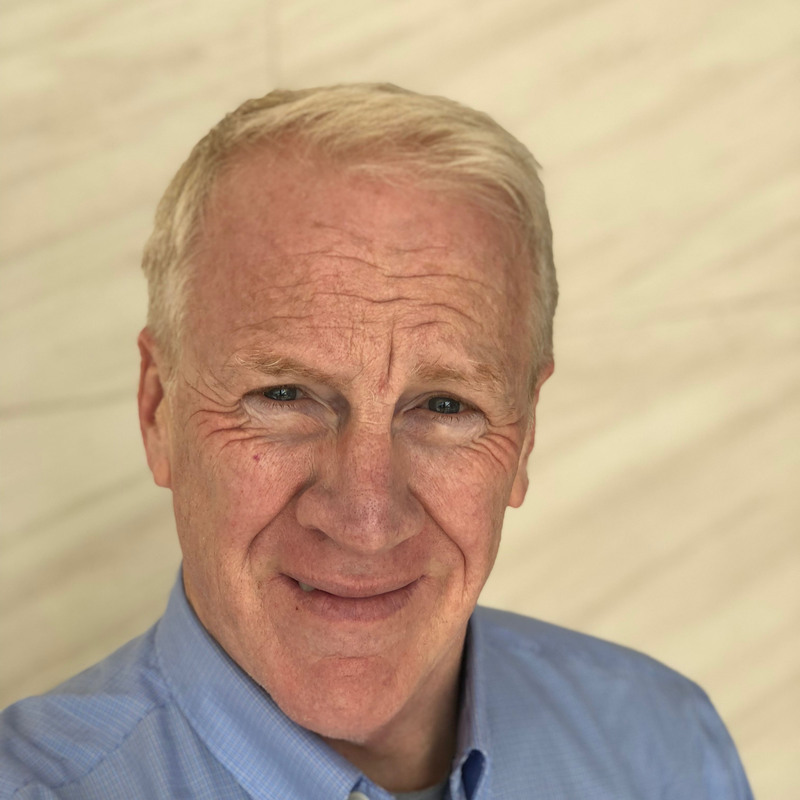 Today's professional services buyer is stretched to the limit - the solution you offer is usually just one small part of your buyer's professional life. That's why it's so important to make it easy for them to buy from you. The graphic below illustrates the point. 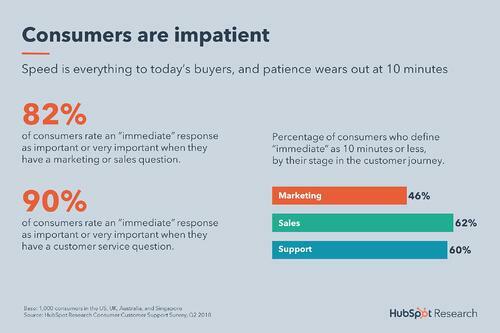 As you can see, the vast majority of buyers want an immediate response when they have a sales, marketing or customer service question. And by immediate, most buyers mean 10 minutes or less! It almost seems impossible to meet these standards. But with the right technology, you can make it easy for prospects to buy from you. 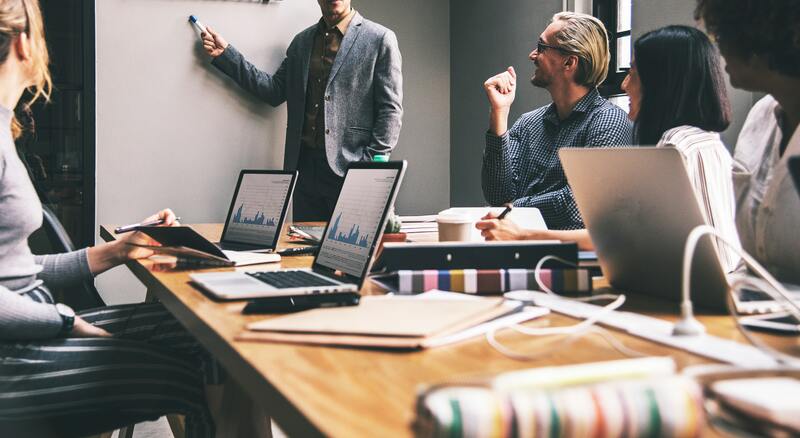 Here are 4 ways to make your business development process more efficient with HubSpot Sales software, part of the HubSpot Growth Platform. Don't think live chat is important? 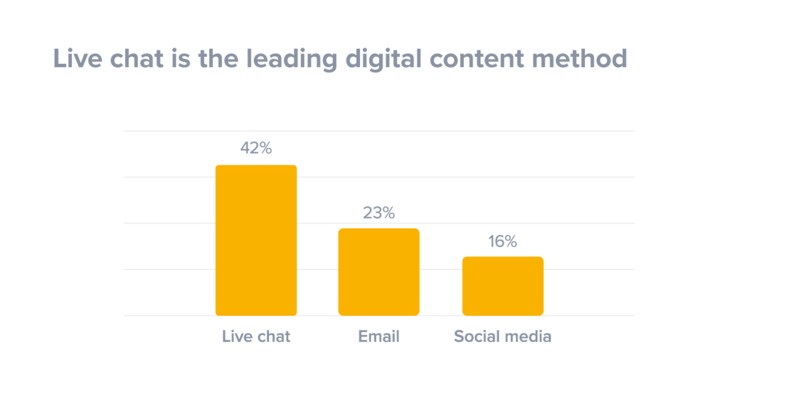 CRM provider SuperOffice found that 77% of consumers won't make a purchase on a website where live chat is not available, but only 9% of companies use live chat on their website! HubSpot offers live chat as well as conversational bots in all versions of it's sales software, including the free version. Keep in mind that the free version will include HubSpot branding. Don't worry, you don't need to hire staff to monitor and respond to live chat requests. HubSpot's mobile app (available for Android and iOS) allows you to answer chats on your mobile device. The conversational bots take live chat to the next level by using artificial intelligence to respond to simple requests and direct chatters to the appropriate person to answer their questions. For example, a conversational bot could ask the chatter if their question is related to sales or service. They can then be routed to the appropriate resource based on their response. 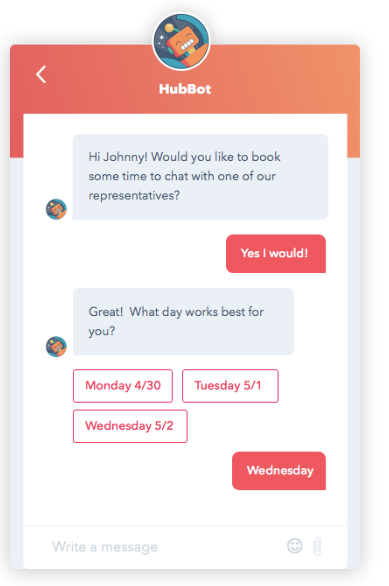 Here is an example of a simple bot to book a meeting with a representative. If you're in the professional services or technology businesses, you should make it very easy for a potential customer to schedule a demo or a consultation. This first part of making this easy is to have a clear call-to-action or pop-up on your site that offers the ability to book a demo or consultation. The way most companies follow up on these requests is to have someone call or email the prospect a day or more later to schedule a time. Think about this from the prospect's point of view. They are juggling deadlines and responsibilities and probably talking to your competitors. By the time you get back to them, their response is probably, "Who is this?" The HubSpot Meetings tool integrates with your Google or Office 365 calendar to allow your prospects to book time to meet with you. Because it integrates with your calendar, it won't offer times that you've already booked. It can also be configured to only offer time slots in periods that you define. For example, you can choose to offer consultations on Tuesdays and Thursdays between 1 and 5. You can include Meeting links in your email signature and embed them in your website. Through the email integration, you can insert meeting links directly into the body of your email without leaving Outlook or Gmail. We've integrated our Zoom conferencing software so that a Zoom invitation goes out with the automated meeting confirmation email. Here is a video on the HubSpot Meetings tool. Check out this video: https://share.vidyard.com/watch/pZCfMzjSUdQ99PSS7xY5Ze? The best way to consistently generate sales opportunities is to focus on a target market and develop messaging and content that helps buyers in that market segment be effective in their jobs. Today's buyer is looking for specialists, not generalists. HubSpot's email templates allow you to craft messaging that resonates with your target buyers and use it consistently in your sales outreach. By creating outreach templates, you provide a consistent message to the marketplace regardless of which team member uses them. Here is an example of one of our email templates designed to start conversations by sharing thought leadership. Email templates can be used for many different sales and customer service communications including welcome emails to new customers, networking follow-ups and cross-sell opportunities. It's important to understand that templates are just that - guidelines to help you quickly send an outreach email. Each email should be personalized with a sentence or two to contextualize it to the person and the situation. One of the things that we like about HubSpot Sales is that it integrates with Gmail and Outlook so that it can be used as part of your normal workflow in your sales process. You will note that in the sample template above we offer the ability to schedule a Professional Services Marketing Consultation using the HubSpot Meetings tool. 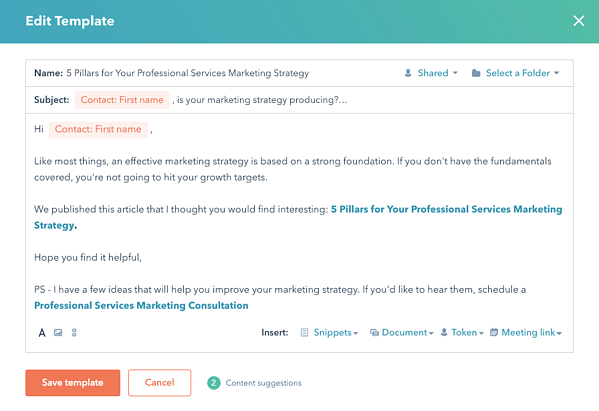 HubSpot's Sequences tool allows you to send a series of templated emails as well as schedule tasks like telephone follow-ups and LinkedIn connections. Sequences can be configured for events like trade show follow-ups and website conversions to make it easy to consistently follow up with potential sales opportunities. Standardized communications - you can consistently promote your message throughout the marketplace, regardless of which team member is initiating the communication. Increase sales productivity - you can quickly distribute effective communications and follow-ups by avoiding "re-creating the wheel." As much as we believe in the benefits of selling through attraction, it still benefits you to get your message in front of as many eyes as possible. Using data to optimize your results - HubSpot tracks email opens and clicks for each template, so you can analyze what's working and what isn't. This allows you to optimize your outreach based on marketplace feedback. Sales technology is a must for modern professional services businesses. HubSpot offers affordable options for businesses of all sizes to effectively execute their business development processes. If you'd like to see how you can use HubSpot in your business, schedule a consultation with us. Learn how to align your business development process with modern buyers.